There was trouble in the chicken coop. As four young roosters came of age, they began to fight. Their mistress sent them all away, leaving the hens all alone. 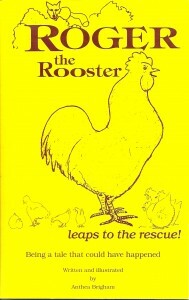 One of the roosters, Roger, was sent to a petting zoo. Roger was homesick. He began to practice leaping as high as he could, in hopes of escaping from his cage. But with no success. Then one day his mistress arrived to take Roger home – with no rooster on duty, the hens in the coop were being threatened by a fox. Back in his familiar chicken coop, Roger was proud and happy to have been chosen to protect the hens. One dark night the fox did attack, but Roger sprang to the defense of his hens. Putting into action the skills he had practiced in the petting zoo, he leaped repeatedly onto the back of the fox. Startled by the attack, the cowardly fox crept away. All was safe in the chicken coop, and Roger was a hero to his mistress – and especially to the relieved hens he had rescued from danger.